All over Canada, our Gorilla experts are becoming more and more popular. With services available at all hours and during all seasons, it is important to keep up with demand. It is because of this that the Gorilla team is always growing. Property owners in the Regina region and Etobicoke area no longer have to struggle with routine maintenance, they can rely on our newest franchise partners instead. 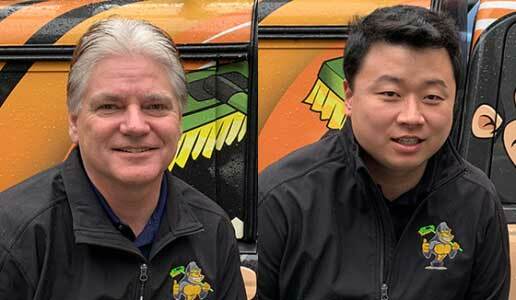 Our team of property maintenance specialists are happy to welcome Darrel and Alex to the Gorilla family. Unpredictable weather patterns in Saskatchewan are enough to keep property owners working constantly. After a long day of work, it can be difficult to face hours of snow clearing or scrubbing stains from exterior surfaces. Luckily for homeowners in the Region area, Darrell and his team of highly trained Gorillas like to keep busy! Our professional property maintenance services offer everything from window cleaning to soft washing in order to leave homes and businesses in the Regina area looking their best. The Greater Toronto Area is a bustling and busy area, so there are always things to do. Local Gorilla franchise partner, Alex is local to the Etobicoke area and understands the ins and outs of maintenance needs. Graffiti, for example, is a growing trend in and around the area, but Alex and his team have all the tools and know-how to keep surfaces clean. In addition to keeping exterior spaces clean, experienced Gorillas can treat weather-related obstacles like cluttered roofs or clogged gutters in order to preserve the condition of homes and commercial properties.When you want to best results for your property maintenance, there is always a Gorilla available in your area. As our team grows, Canadian property owners have more and more access to professional services, all across the country.